We can have breakfast in our guide's house in Niseko and look at the kitchen window and see Mt Yotei. The views can be fleeting before the clouds start to encircle and the views are gone. In fact, ski visitors can come for ten days during January and February and only get a glimpse of its lower flanks. The mountain can be elusive. On this morning, we didn't have the views. 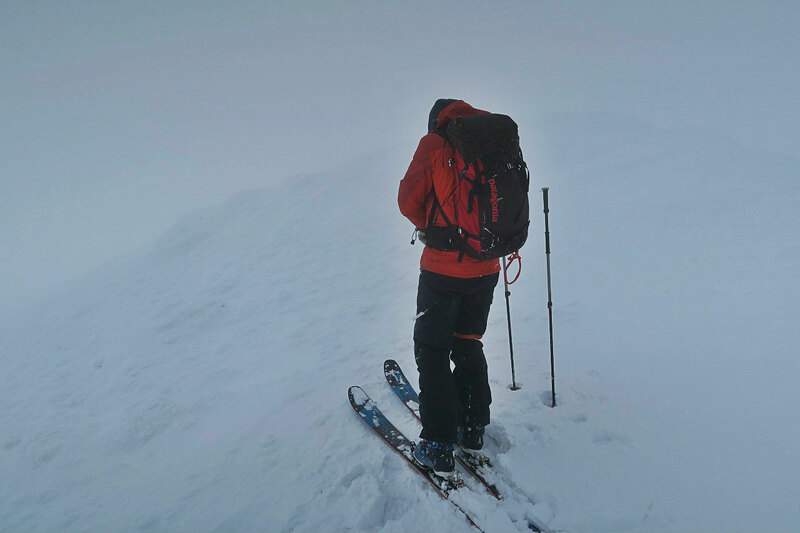 We had limited our skiing the previous day to the tree line due to strong winds and blizzard like conditions. We imagined that anything above the tree line would have got wind hammered from the day before. Lack of visibility would keep us to the tree line anyway. 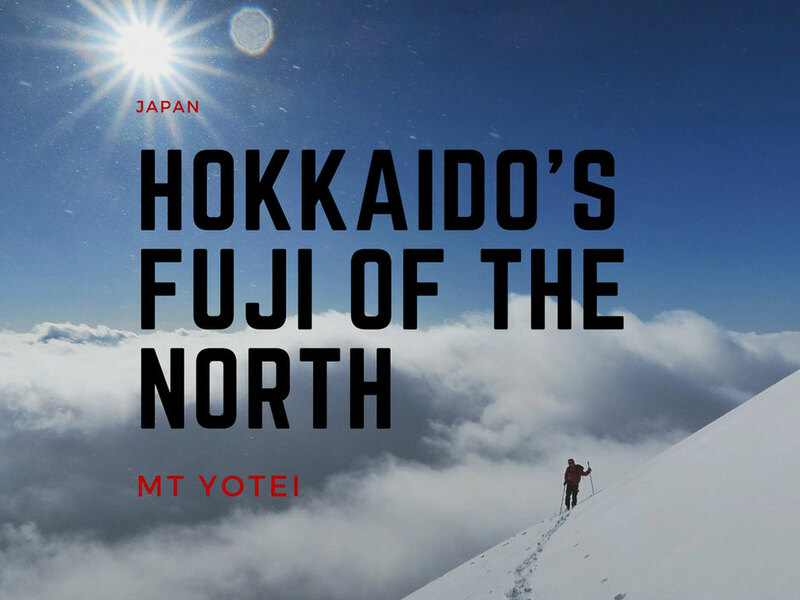 There are a number of mountains around Japan that are referred to as a 'Mt Fuji,' for their likeness to the Mt Fuji. 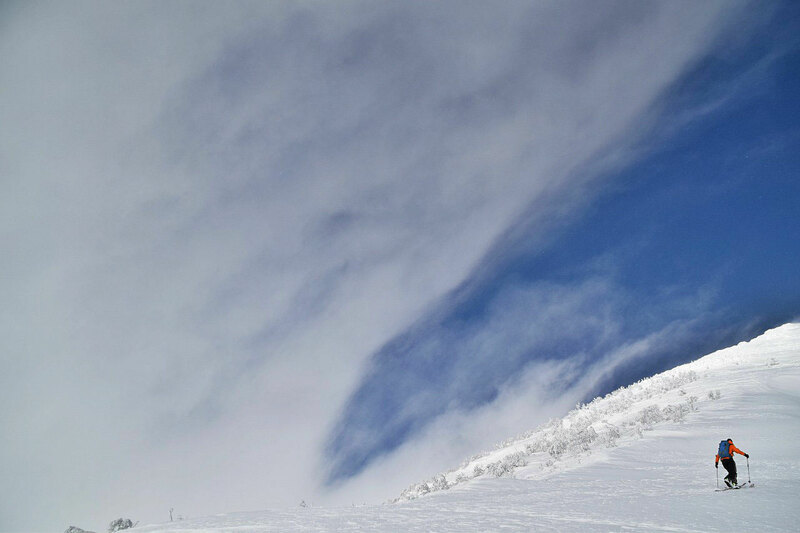 In Hokkaido, it is Mt Yotei. The first time I saw a picture of it was in an Australian ski magazine in the mid 90's, and the caption actually called it Mt Fuji. Maybe they thought that the readership wouldn't be any more the wiser. 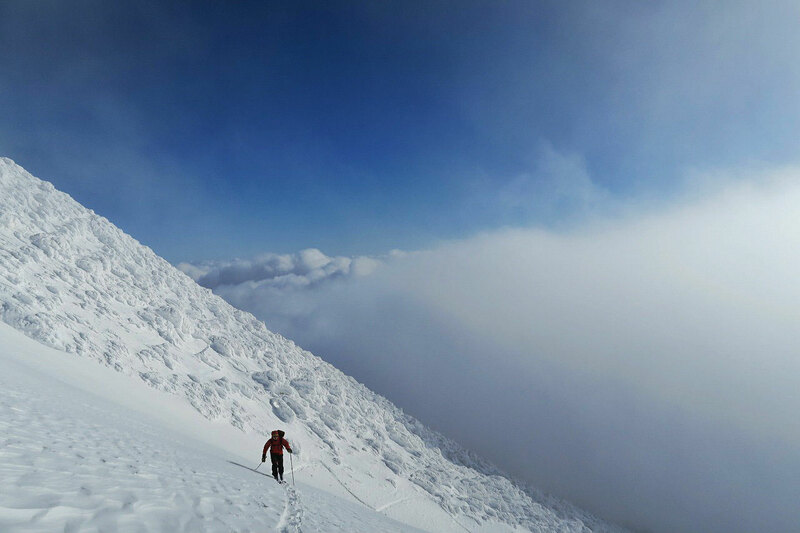 There are a number of different ascent routes up the mountain in winter. Most of these follow the summer hiking routes, often the weather determining which of these we take. The beauty of a conical volcano is being able to choose the aspect that has been the most sheltered from the wind. On this day, we had chosen the south face, which is probably the easiest of the ascent routes. Starting at 300 meters elevation, it is an easy incline through a birch forest. At around 1,400 the trees start to thin and you are then in the alpine zone on the mountain. It is typically here that you make the call as to whether ascend higher or descend from there. 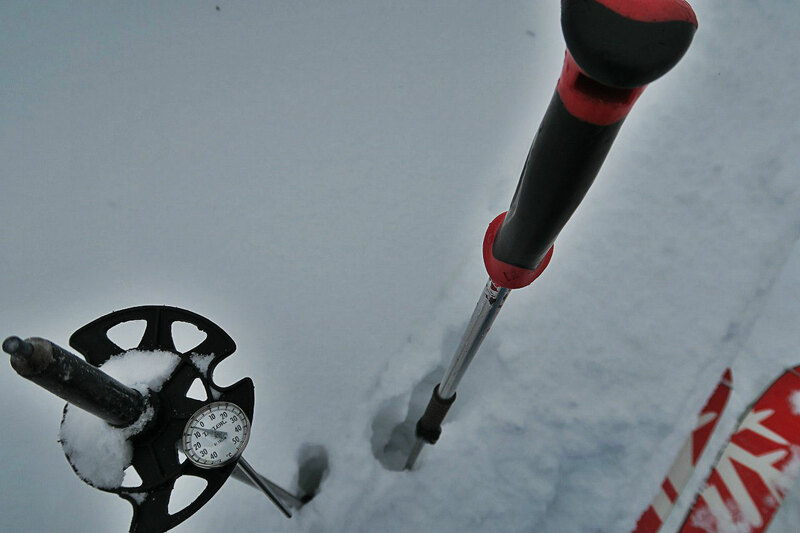 Decisions are dictated by the weather and the state of the snow. Once we were nearing the tree line, we had started to see glimpses of blue sky. At tree line it magically cleared and we found ourselves ascending up in to the alpine area of the volcano. The snow surprised us as well and hadn't been affected by the previous days wind. We had a clear view to the top of the mountain near the volcano rim at 1,898 meters. It really wasn't until the last 20 meter boot pack to the summit that the clouds encircled and closed in. We sat and waited for a clearance that wouldn't eventuate and decided to ski down through the murk. The top 20 meters were what I would call 'chicken heads,' features made by the wind. Once we were beyond this we used our up track to guide us down through the white-out and in to the better visibility of the tree terrain. 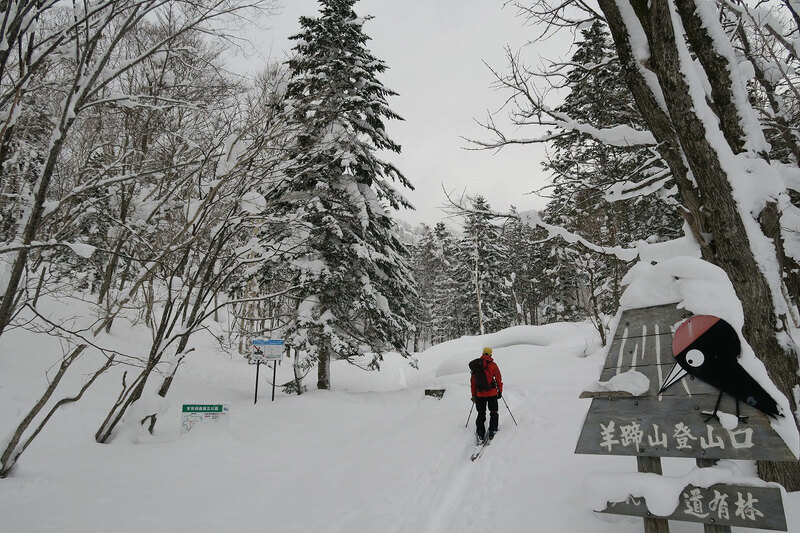 It is certainly one of the longest single descents you will make in Hokkaido. 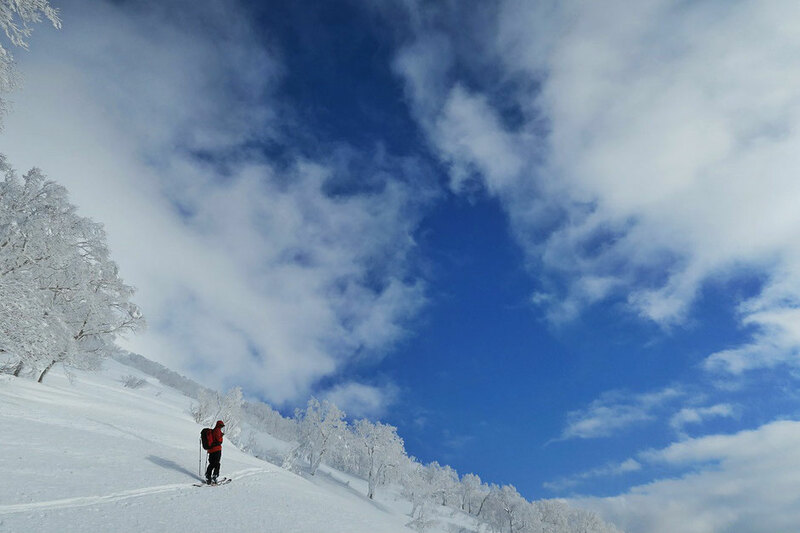 As lucky as we were today with the weather, skiable snow from the summit would give us a 1,600 meter run, of which 1,500 meters of it were in good quality powder. It can be a 5 hour ascent and an hour run down. It is what I would call quality over quantity. A descent that will be etched in to your memory. At the base of the volcano is the Shinto shrine. 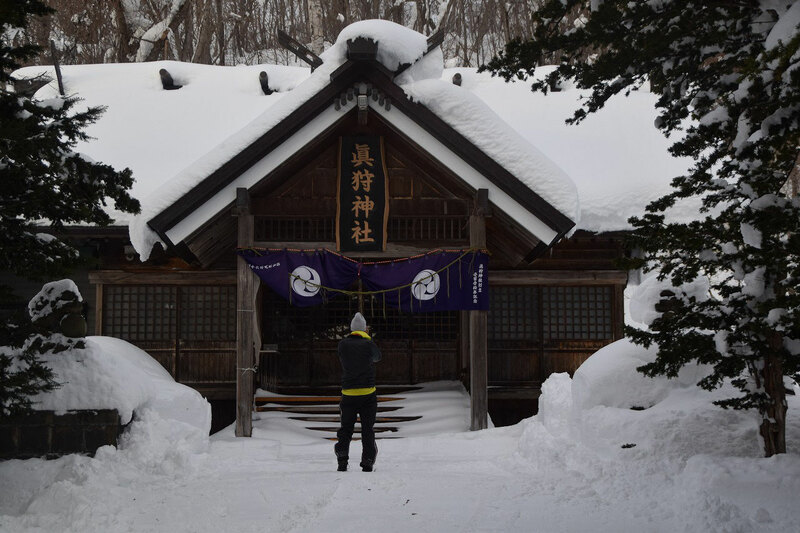 In a few days time, the locals of the area will come to make their new year's resolutions. We will be making some of our own, for many more descents of this great volcano.